Institut de Physique Théorique, CEA Saclay, Paris. *Charla online en vivo desde Francia. Resumen: Supergravity theories are supersymmetric theories of gravity which arise as different low energy limits of Superstring Theory, and therefore can be used to obtain non-trivial information about the latter. Although there exists a rather complete local classification of Supergravity theories, little is known about their global formulation. Being supersymmetric theories of gravity, the first step in order to understand the global formulation of Supergravity is to have a complete classification of the spinorial structures that are needed to formulate the fermionic content of the theory. 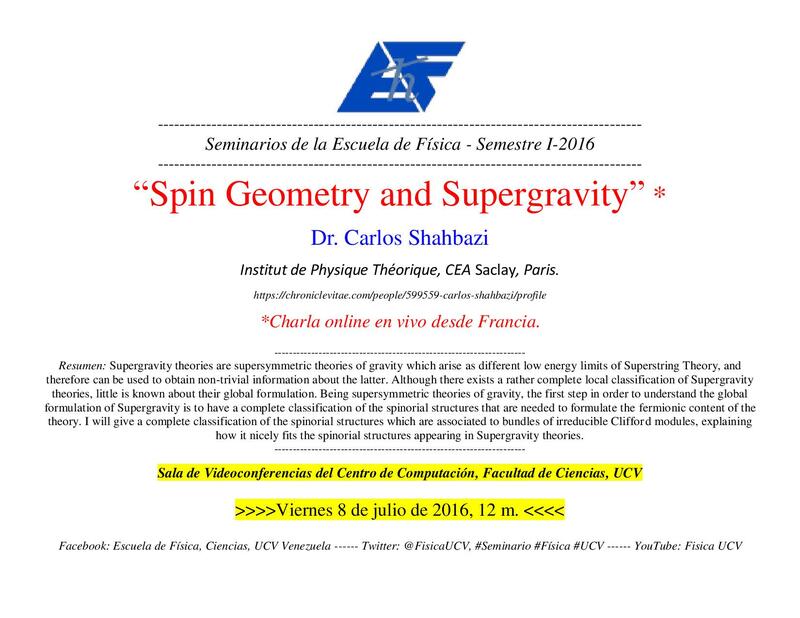 I will give a complete classification of the spinorial structures which are associated to bundles of irreducible Clifford modules, explaining how it nicely fits the spinorial structures appearing in Supergravity theories.